We are settled on the large balcony of the Quay Restaurant on the Upper Level of the Overseas Passenger Terminal, one of the best viewing points on Sydney Harbour. 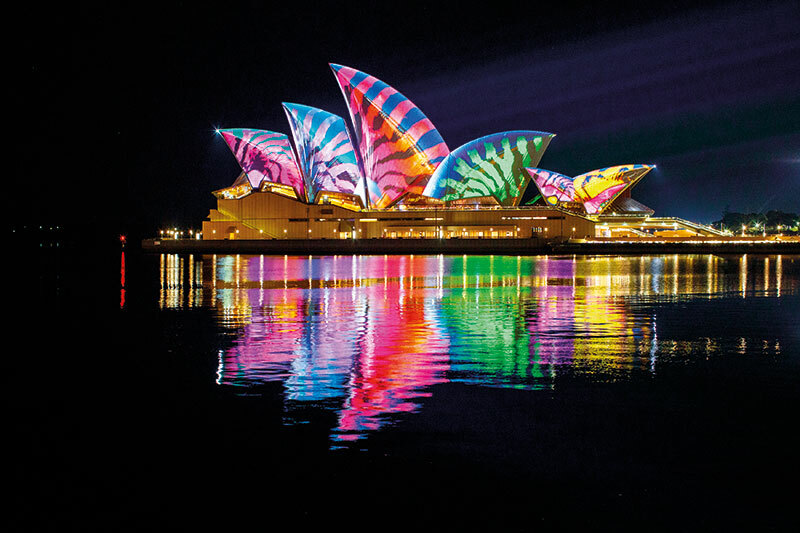 The excitement is palpable as we await the ‘Lights On Moment’ when the iconic sails of the Sydney Opera House transform to officially open Vivid Sydney 2017, an annual festival of light, music and ideas. 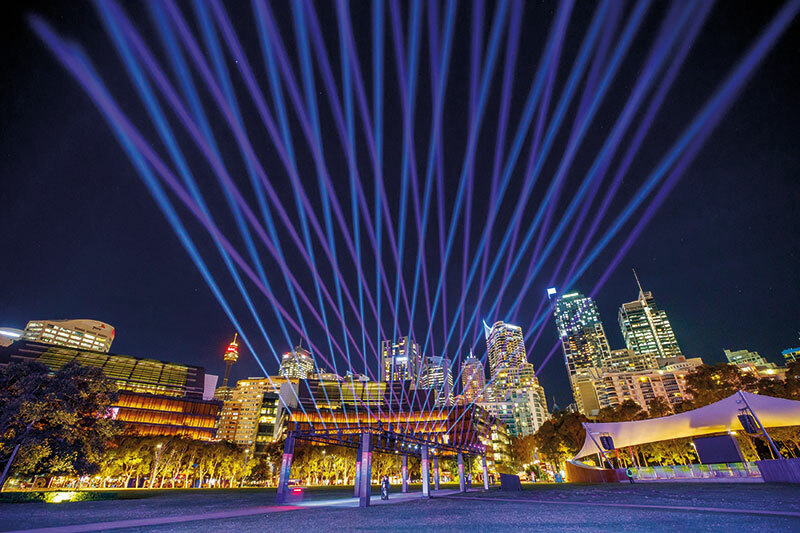 For 23 days in May and June, the city turns into an enormous canvas and also the world’s largest art gallery, as light-art sculptures and projections involving scores of artists, designers and manufacturers from Australia and the world transform this city into a wonderland of sorts. And even as Vivid Light transforms the urban landscape, Vivid Ideas brings together creative and business people while Vivid Music offers more than 400 gigs over 40 venues. The Sydney Opera House is poised on this exceptional night, luminescent in the growing dusk. As darkness approaches at 6 p.m., its iconic sails seemingly burst with projected colour and ever-changing shapes, wavering and shifting gently. Imaginary creatures inspired by the beauty of insect, animal, plant and marine life shimmer across as Audio Creatures, imagined and designed by Ash Bolland, wows the crowd gathered here for this magical moment. Every year, artists from across the world are chosen to portray their work and ideas onto this unique canvas. And now for the Vivid Light Walk, a journey that takes you across the city, through streets and pathways, coves and corners. There are over 60 works on show this year and unfortunately I do not have the time to see the entire gamut of installations. My walk this evening meanders around the harbour as I take in all the lights that sometimes make me dizzy with wonderment. 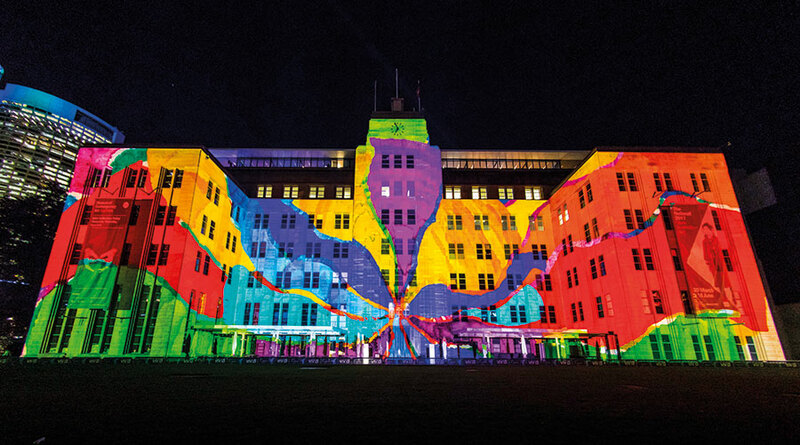 Walking around the precinct called The Rocks — replete with alleyways, restaurants and some of the oldest bars in the city — is the wisest thing to do, with its vast selection of major projections and interactive installations. I meander through expectant crowds embellished with light bands entwined around wrists and heads, creating, as it were, ever-moving installations of their own. My first stop is the historic Cadman’s Cottage where a young girl dances on an interactive ‘keyboard’ projected onto the ground, watching her own music compositions translated into unique displays of colour on the building facade. Each note she hits with her feet is represented as an audio and visual element. As I walk on, I am overwhelmed by what’s happening on the sandstone building of the Museum of Contemporary Art Australia (MCA). Organic Vibrations is a collaboration between Australian artist, Julia Gorman, and Paris-based creative and artist collective, Danny Rose. A series of bright and brilliant-hued abstract images, sometimes swirling, at other times taking on 3D outlines, move seamlessly across the facade. This installation uses projection-mapping techniques with images originally made by the artist in watercolours, oils, marker pens and paint. I am not surprised that a large number of people are seated on the grass up front taking in this spectacle of flowing light. I debate about joining them but the sight of a traffic warden holding a sign stating ‘Royal Botanic Garden’ nudges me onwards. I follow the well-managed crowd to where the Sydney Opera House continues to shift and change in its multihued light garb. Couples, families and friends are seated on the large steps leading up to this magnificent building, enjoying the crisply clear evening. You may take a special behind-the-scenes tour of this vibrant building, attend the Vivid Live contemporary music programme in its performance spaces or dine at one of its many restaurants and bars. I, however, walk past the Opera House and veer towards the entrance of the Royal Botanic Garden. These gardens are transformed for the occasion with numerous installations showcasing new developments in projection, lighting and sound technology, enabling artists and creators to use plants, rock walls, tree canopies and the magnificent trunks of 100-year-old Ficuses as organic canvases. The first installation that I come to, Waratah, is a tribute to the flowering plant native to Australia and floral emblem of the state of New South Wales. An interactive piece, it responds to touch and sound, bursting into vibrant colour from its ambient resting glow. Next, I walk past The Sunflowers, a light installation that joyously towers over our heads with the ‘flowers’ lined up in large pots to one side. Solar panels harvest energy during the day and light up these flowers at night. The Birds of Lumos now create a jam along the path as cameras and flashbulbs go crazy. This sculpture introduces you to Rowi, a rare species of kiwi and her chick, making a fitting comment on the importance of conservation and protection of wildlife. The birds’ bodies are made of light globes, the beaks have nostrils and they wear sight-enhancing night goggles since kiwis are known to have poor eyesight. No wonder these two are such crowd-pleasers. Past the area demarcated for food and drink, I encounter inSIGHT, an enormous, low-fidelity display of the human face that changes expressions, gender and character even as you watch. Woven through this sculpture are strands of programmable LEDs, illuminating the changing images. Electric Forest is an incredible tableau devised by senior students from TAFE NSW. Then, encounter You Lookin’ at Me? consisting of glaring eyeballs scattered around the grass. Not surprisingly, these are interactive too and behave like watchful predators so beware and do not get too close! By now, the night is upon me and I find myself at the end of my designated walk. But the city continues to throb and flash as I make my way to my hotel. There are so many more light installations to be viewed, food to be had from food trucks sprouting everywhere, beer to be guzzled from crowded bars. But all that I keep for another day as I wind down happy and content with the sights of this marvellous night in Sydney.